I’m nearly ready for Christmas, at least the presents are wrapped, just food to prepare and a bit more shopping to do and then I can sit down and relax. Books ‘“ buy or borrow? I’™m not sure which one to pick. It won’™t be On Chesil Beach because I’™ve already got that book. The others all look as though I’™d like to read them, so when I get time I’™ll be reading the extracts, before deciding which one to pick. Well, that’™s about free books, but the magazine is packed with details of other books and it’™s simply not possible to buy all or even many of them. This is where the Library is a fantastic service. I borrow more books than I buy ‘“ fortunately says my husband! I have always, as long as I can remember, been a member of a library and for a while I worked as a librarian, so I’™m always enthusiastic about libraries. Where else can you get such a wide-ranging and all encompassing supply of free books? Although I’™m extolling the virtues of the library system I also buy books, because there are books I want to read again, books to read at leisure, without being told I’™ve got to return them as someone else has reserved them and books I want to own. I buy books regularly (too regularly my husband says) and from a variety of different sources ‘“ local bookshops, there are several really good ones locally. I prefer to check out the books in the shops where possible but I also buy books from Amazon and other on-line booksellers. So, it’™s a big help to find that BooksPrice now has a UK website that compares prices from on-line booksellers. Next year I’™ll be checking them out before buying a book. 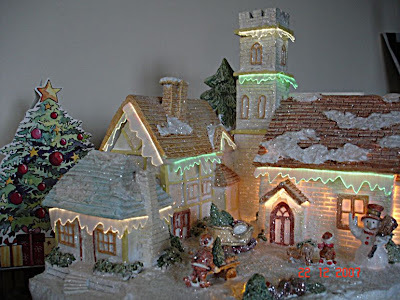 Author MargaretPosted on December 21, 2007 Categories Books3 Comments on Books ‘“ buy or borrow? Booking Through Thursday – And, the Nominees Are’¦. And, do ‘œbest of’ lists influence your reading? Looking through the list of books I’™ve read this year I see that most of them are not new books published in 2007, so I don’™t have much difficulty in deciding which ones I would nominate. My brief descriptions only give a flavour of the books and although they are all different it seems they have a lot in common ‘“ love and memories and loss. The Verneys by Adrian Tinniswood ‘“ the lives of the Buckinghamshire Verney family in turbulent seventeenth century during the English Civil War ‘“ love, war and madness. ‘œBest of’ lists are interesting and I suppose they do influence my reading to a certain extent. Since I started reading blogs, about two years ago now, I am more influenced by recommendations from bloggers, particularly when I know they have similar reading tastes to mine. I’™m also influenced by books I see in bookshops and especially in my local library. Sometimes I prefer to pick up a book without knowing anything about it or the author and am often surprised by how much I enjoy it. Author MargaretPosted on December 20, 2007 Categories Booking through Thursday, Books15 Comments on Booking Through Thursday – And, the Nominees Are’¦. Sunday saw the last episode of ‘Cranford’. The final episode was very dramatic and there was a happy ending but overall I still felt disgruntled by the combination of three of Elizabeth Gaskell’s books. I suppose that if I hadn’t read ‘Cranford‘ I’d never have known that the difference. I wouldn’t have missed the parts that had been left out and I wouldn’t have known that the order of events had been changed. I enjoyed the non-Cranford scenes much more – the railway explosion and injuries, the Sophie/Dr Harrison love story and above all the Lady Ludlow scenes and the interaction between Lady Ludlow, Mr Carter and Harry. I thought that Alex Etel who played Harry Gregson was excellent. Tonight the first part of ‘Oliver Twist’ is being broadcast at 8pm (not 9pm as I thought) on BBC1. I don’t have enough time to read the book before 9pm, so I shan’t be disappointed if the 5 part series (being shown in four nightly episodes this week and the fifth and final episode next weekend) is not faithful to the book. I haven’t read it before, but of course the story is so familiar from other films, musicals and TV productions. I don’t expect it to disappoint as ‘Cranford’ did, as I don’t suppose it will be a combination of three of Dickens’ books! 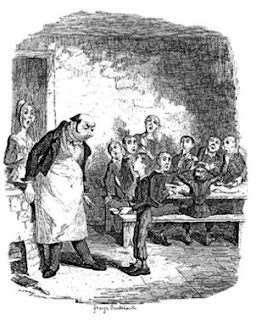 Can you imagine combining ‘Oliver Twist’, ‘David Copperfield‘ and ‘Nicholas Nickleby’? I’m also looking forward to watching The Old Curiosity Shop on ITV1 on Boxing Day. I haven’t read that either so I can watch it without any pre-conceived ideas. I actually started my blog in July 2006 but only wrote one post, so I’m starting this list in April this year. I’ve been meaning to write more, both in this blog and in other writing, but somehow there’s always something else to do. Sunday was sunny, just perfect for a Bluebell Walk at Rushall Farm. It was D’™s birthday last Saturday and the grandchildren painted some beautiful pictures to give him. Can anyone identify this please? (It was a Cinnabar Moth). The year is on the turn and autumn is on its way. Whilst in Stratford last week I browsed the bookshops, one of my favourite pastimes, and couldn’t resist buying The Complete Stories and Poems of Lewis Carroll. Crossing to Safety was Wallace Stegner’™s last novel published when he was 78 years old. Any One for Brussel Sprouts? We had to stay at home today, waiting for deliveries, so we had our shopping delivered as well. All well and good. We opted not to have our shopping put in carrier bags (thinking of the environment), so most things were loose, with just a few items wrapped. Everything on the order was there. Imagine my surprise to find a little bag containing one tiny brussel sprout. 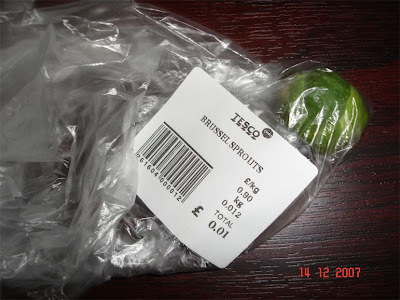 When my husband had done the on-line ordering he hadn’t noticed that he needed to enter the weight required and had just put “1”, so that’s what we got – one sprout costing one penny! Fortunately he says he’s happy to share it with me. Author MargaretPosted on December 14, 2007 Categories Personal10 Comments on Any One for Brussel Sprouts? An intriguing book. This is the first book I’ve read for the From the Stacks Challenge. 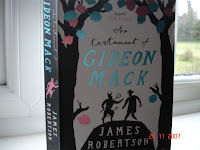 Gideon Mack was a minister in the Scottish Church, even though he did not believe in the existence of God. He simply didn’™t discuss religion and discovered that ‘œit was possible to be a Christian without involving Christ very much’. He concentrated on works rather than on faith and threw himself into raising money for charity. One of his fundraising events was running in the London marathon and he found that running made him ‘œimmune to the world and its problems.’ Whilst out running in the woods he came across a standing stone that he was sure had not been there before. It is this stone that drew him further into the mysterious events that led to his disappearance. He took photographs of the stone, but they failed to come out. It is not clear whether the stone was actually there or not, any more than it is not clear what actually did happen to Gideon Mack. Be aware:there are possible spoilers ahead. As well as being a faithless minister Gideon was married to a woman whom he did not love and he was in love with Elsie, his best friend’™s wife. As I read the book I realised that it’™s just not clear whether Gideon’™s account is truthful and how much of it can be believed. Did he have an affair with Elsie or not? Did he see the standing stone, or was it just a figment of his imagination? Was he mad or deluded or what? What is clear is that he fell into a ravine, trying to rescue a dog that fell into the Black Jaws and he was ‘œchurned and spun like a sock in a washing-machine, carried along by an immense, frothing, surging force.’ He thought that he ‘œcouldn’™t possibly have survived the fall’ but even if he had ‘œthe river would have killed’ him. He thought he must be dead. And it is at this point that he found he had been rescued by the Devil and spent three days with him before he eventually returned home. He claimed the Devil had healed his leg, broken from the fall, discussed the nature of belief and God with him and swapped his trainers for Gideon’™s shoes. Are the trainers proof that the Devil does exist? When Gideon saw the trainers they triggered his memory ‘“ but is his memory reliable? What is real, what is imagined and what is illusion?